The picture shows my part complete valve tester which is closely based on the AVO model 163. The top section is complete and the lower section is awaiting a replacement transformer in order to complete the mechanics and wiring. The two sections will be connected via a multiway flexible cable. I have added a simple facility to check VR tubes with a selection of current limiting resistors. The AVO selector switch could not be procured so I have used a separate combination of rotary and toggle switches around the outer edge of the upper section to provide the equivalent functionality. A 15 way adaptor socket has been provided to connect to an assortment of external sockets or direct on to a valve via flexible cables and crocodile clips. The main difficulties were in obtaining the multi-tap transformers to provide the heater and HT supplies. 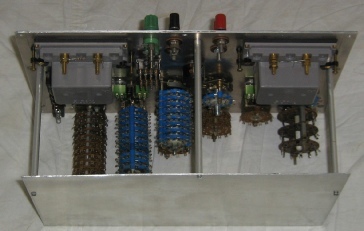 The solution was to obtain another, somewhat older, valve tester and use key components from that with some additions to fill in the gaps - a total of seven mains transformers. The picture on the right shows the lower chassis unit with the selector switches installed but less the mains transformers. Switch wafers handling the heater supplies have two wafers in parallel to increase the current capacity. Quite a few of the switch wafers have mostly wire links and just a few wires so the wiring process is not as difficult as it looks. All switches are break before make to avoid putting shorts on the mains transformers or rectified supplies. The relatively small number of discrete components will be supported on tag strips.